Maui is best known for its beaches but like all the Hawaiian islands is able to offer a lot more than sand and the ocean. Another exciting aspect of Maui is Haleakala National Park, a place full of eerie volcanic landscapes, whose peaks stretch above the clouds and 10,000 feet above the sunny beaches. Haleakala National Park is located around the Haleakala crater, which is not actually a crater as many people believe but a valley which was carved into a volcano by thousands of years of erosion. It is technically called a shield volcano, whatever that means (actually I looked it up on the web, and it means "volcanoes with broad, gentle slopes and built by the eruption of fluid basalt lava"). Haleakala has last erupted in 1790 but it's considered an active volcano and it's being monitored. 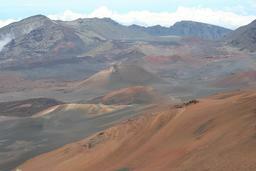 It is estimated that Haleakala has been above the ocean surface for about 1.1 million years. The Hawaiian name Haleakala means "house of the sun", a name that fits in my opinion. What is just about impossible to prepare for is the weather. We visited Maui in April and we went to Haleakala the second day of our trip. The weather turned out to be nasty, it was cloudy and foggy and it was impossible to see anything. For short periods of time the fog will part and you'll get a glimpse of the crater enought to make you gasp and than it will all be covered in fog again. So we decided to come to the summit once again and did so on the last day of our vacation. This time the weather was glorious, sunny and clear and we were able to hike into the crater and take beautiful pictures. You do need to bring a jacket, it's windy up there. In contrast to the red and gray bare lands of the Haleakala Crater comes the Kipahulu section of the park which is lush and green and full of waterfalls. To get there you'll have to drive the highway to Hana, another narrow, twisting, full of hairpin turns road. The highway will lead you to the pools of Ohe'o, aka "Seven Sacred Pools", a name that is actually a marketing gimmick (they're not sacred and there aren't seven of them). In conclusion, this is a fine park and if you visit Maui, this is one place you must see.